A union convenor at the Linamar Plant in Swansea, formerly owned by Ford Visteon has locked himself in his office after being sacked. Rob William, a Unite union convenor and vice-chair of National Shop Stewards Network, has been sacked at the Swansea Linamar plant today for supporting the sacked Ford/Visteon workers in Belfast, Basildon and Enfield. The convenor has locked himself in his office at the plant and is refusing to leave. Linamar is the company that purchased the Swansea Visteon/Ford plant, and the union convenor was one of the first to visit Visteon/Ford workers in the Belfast occupation, now almost one-month old. "called into the directors' office of the plant on Tuesday 28 April and told that he was being sacked for "irretrievable breakdown of trust". This blatant victimisation of one of the leading left-wing shop steward activists in the car industry was met by an immediate production line walk-off by the day shift. They surrounded Rob's union office after management called in police to forcibly remove Rob from the building." Linamar also has Visteon's Steve Gawne, the manager whose house was protested at by sacked workers, on its board. This was all I had on it and might have even spelled it wrong! Rob Williams, the Unite convenor of the Linamar car parts factory in Swansea and vice chair of the NSSN, was called into the directors' office of the plant on Tuesday 28 April and told that he was being sacked for "irretrievable breakdown of trust". This blatant victimisation of one of the leading left-wing shop steward activists in the car industry was met by an immediate production line walk-off by the day shift. They surrounded Rob's union office after management called in police to forcibly remove Rob from the building. Rob has been very active in the campaign of the sacked Visteon car parts workers and has recently visited all three of their plants. His sacking is likely to be linked to his role in this struggle. The Visteon Unite convenors are demanding that Rob be reinstated and they, alongside many others, are calling on Unite joint general secretary Tony Woodley to also back the immediate reinstatement of Rob. Linamar today ‘offered’ 200 voluntary redundancies at my plant in Swansea. This amounts to about 60% of the workforce. The shop stewards committee has informed the Company that because the job losses include ones lost because thy are switching some of our production to Mexico, we will be asking our members to ballot for industrial action. In addition, any compulsory redundancies will trigger a ballot. This blatant victimisation of one of the leading left-wing shop steward activists in the car industry was met by an immediate production line walk-off by the day shift. They surrounded Rob's union office after management called in police to forcibly remove Rob from the building. What are the chances of the factory workers coming out on strike in support of Rob Williams? It sounds that they are already potentially angry over possible redundancies. "The company called me into the office and the plant manager and the group president gave me a letter just terminating me, without representation, without any disciplinary procedure. They accepted that I haven't committed any acts of gross misconduct and basically said it's because everything they try and do in the plant the union challenges, so it's blatantly for trade union activities. It says everything about the law in this country that it contravenes any rule, it would be totally defeated at an employment tribunal, and yet the action the boys took to defend me is illegal. The workforce response was fantastic. They were a bit nervous, clearly this is a brutal, cynical attempt. But once the boys knew what was at stake they rallied round. The company wanted me to leave the premises, I refused to. I then ran through the offices, through the plant into the union office which the company can't open. There were five policemen brought onto the site to get me out so the boys came round the office, refused to go. When that happened the police were obviously very wary then and left the site. Clearly the bosses see the recession as an opportunity to attack the workforce, where those workplaces are where the union is strong they want to attack the union. We've got a fantastic history in the plant, defending our terms and conditions and contracts and our jobs and they see it is unavoidable that they have to take on the union to get what they want. Therefore you've got to fight and there's got to be united action, and that's why the Visteon workers should be supported in their action. Companies have drawn the conclusion that workers shouldn't expect decent jobs, decent terms and conditions and the only way we're going to keep them is if we fight for them." According to the Socialist Unity site, Rob has been put back on the pay roll and negotiations are to take place between management and the union at 1pm tomorrow. There is apparently a protest outside the factory gates at that time. Stand up for rob and the boys .this guy is not a man of his word wht investment. I heard on the phone this evening that he has been reinstated. As I understand it from the Socialist Unity site, he is currently back on the payroll and is still plant convenor. However, there are more negotiations to come on the issue next week and it's important to keep the pressure up. Six guys from the Belfast Visteon Occupation visited Rob Williams in solidarity on Wednesday after staying Tuesday night with the Lewisham Bridge occupiers. I imagine that the bosses have backed off temporarily because they are worried sparking off further industrial action. Any update on the meeting with Tony woodley & co in london, as information is slow getting to those who need to know. Andy.Richards@unitetheunion.com ask this man robs suporters. UPDATE: Andy Richards, Welsh reg sec, is representing Rob; and, they're awaiting a decision. 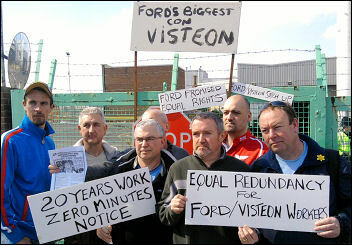 Visteon workers from Belfast occupation have joined the supporters outside the plant. over 2100 signatures so far please add yours to help in their fight. Wednesday 7pm: We understand that today's negotiations between the union and Linamar management have ended. More negotiations have been scheduled for a week's time (Wednesday 6 May). In the meantime Rob remains in his job and as Convenor of the factory. Determined action has forced Linamar to think again." Great news, let's hope everything can be settled, and Linamar can get back to making car parts, and Rob get back to representing his workforce as a powerful and principled voice for the shop floor. After a meeting today (Weds May 6) between union and management Rob Williams has been sacked. Rob Williams, trade union Convenor of Linamar Swansea, was sacked by the Linamar management last week, and then temporarily re-instated following militant action by the Linamar workforce. Disgracefully, however, Rob today had his sacking confirmed. Negotiations between Linamar management and Tony Woodley took place all day in London, but Linamar did not shift. Meanwhile at the Swansea plant Linamar revealed their brutality. Massive intimidation of the workforce took place - including foremen going around the shop floor threatening workers with the sack if they dared walk out in support of Rob. The bosses even went to the ludicrous lengths of removing the door from Rob's trade union office. This brutal action by Linamar is an attempt to return to the nineteenth century. What Linamar do not realise, however, is that all hell is going to break loose when workers, both in the Swansea and the wider labour movement, hear how Rob and his members have been treated. The official reason for his sacking was "irretrievable breakdown of trust" - one of the most blatant excuses to behead a trade union organisation ever used in any factory. Rob's record in standing up for his members, both inside and outside the factory, is second to none. However, what is at stake here is not the fate of one individual but the right for workers to be represented by the best militant fighters. This sacking has to be totally opposed. The union has promised rapid action to organise a ballot for an official strike, but the anti-trade union laws mean this could still take up to a month between the ballot and the strike action actually taking place. That time, which must be kept a short as possible, needs to be used to pull out all the stops in support of Rob. Messages of support and donations should flood in. If Linamar are allowed to get away with this, no convenor or shop steward, either in the already weakened car industry or in the wider trade union movement is safe. Allow the employers to inflict a defeat here and no trade unionist, shop steward, let alone a convenor, will be able to put their head above the parapet without the bosses seeking to cut it off. Workers are facing the worst economic crisis since the 1930s. Big business is doing their utmost to make sure that it is the working class that pays for the crisis. Militant, fighting trade unionism - symbolised by Rob Williams and the union organisation in Linamar - must not only be preserved but strengthened in order to prepare the working class for the capitalist offensive that is under way in Britain and worldwide. Everything must have an end and to progress or advance in any way you must know where you are going. Sometimes though, we can become so immersed in searching for the path that leads us to our destination, that we forget that the hardest part of the journey is finding where to begin.